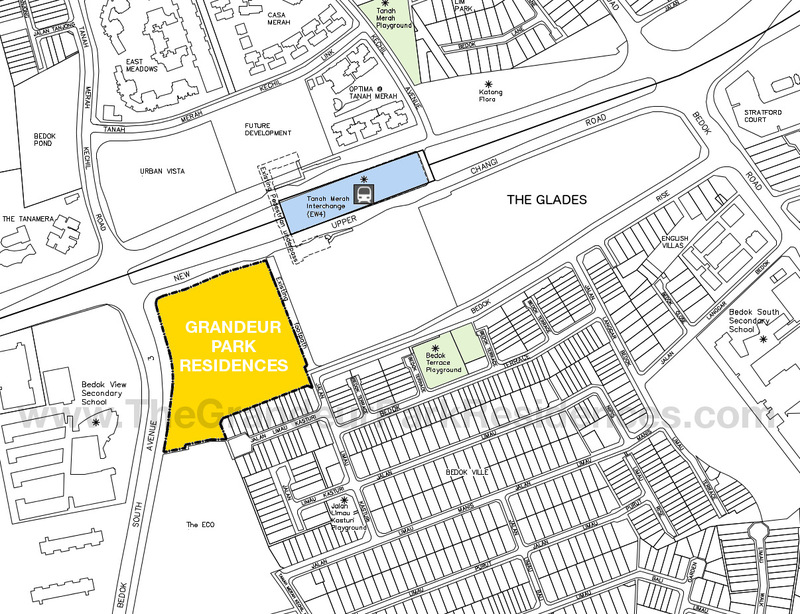 The Grandeur Park Residences location is up a small slope at the corner of New Upper Changi Road & Bedok South Avenue 3, and borders private condominiums & low-rise landed homes on the other 2 sides. 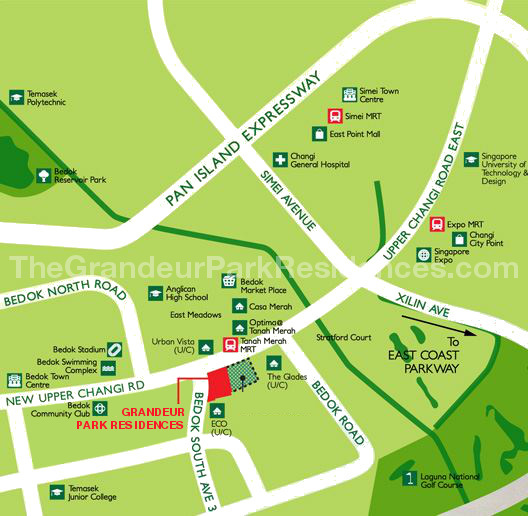 It is very conveniently sited, just beside Tanah Merah MRT Station. Above is a view of the Grandeur Park location from the corner of Bedok South Ave 3 & New Upper Changi Road with the MRT line on the left. Property investment is all about location, which makes this development a fairly attractive proposition. Having an MRT station on your doorstep is the first step. Especially since it is on the East-West line that runs right across the island, directly linking to the CBD & Marina Bay Financial Districts, and to the upcoming commercial hubs of Paya Lebar & Jurong Lake, as well as to Changi International Airport on the east. In a private condominium & landed housing estate. One train station from Bedok MRT Town Centre and Changi Business Park. One station from the 4th university, the SUTD (Singapore University of Technology & Design). 2 stations to Changi International Airport & Jewel, and to Tampines Regional Centre. Easy access to the CBD & Marina Bay, and other parts of Singapore via major expressways like the ECP, PIE and TPE. Rental pool from the commercial hubs and business and technology parks nearby like the Tampines Regional Centre, Singapore Expo, and the Changi International Business Park.